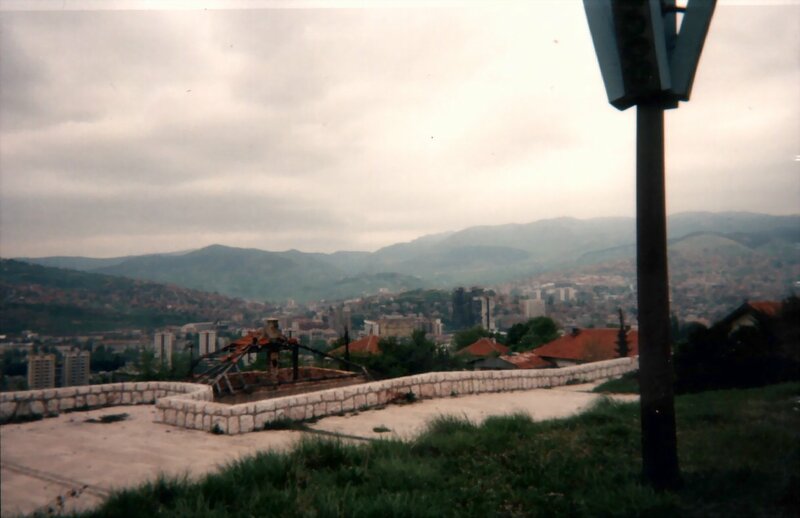 We were not allowed to take camera's with us on this trip (the Bosnian Serbs didn't like peeping Toms), but this photo was taken on a quiet spot on the hills surrounding Sarajevo. The same hills used by the Serbs to shell the city. I personally never been downtown. The closest was the airport and the road around the city. The quality of the photo is not really great, it was a disposable camera. A few months later the Dutch Royal Marines in the Rapid Reaction Force bombed the crap out of these positions. The marines used their shell radar systems to exactly pinpoint the Bosnian Serb artillery/mortar positions. A few mortar shells later and Sarajevo was a bit safer to live in. I spoke with an officer of the Dutch Marines, he said it was very nice to witness. They could see the Serbs running around their positions just before they fired the mortar shells, after that, everything was quiet at that spot. Of course, the general public in the Netherlands doesn't have a clue about what really happened in Bosnia... The common idea is that the Dutch troops hopelessly failed to do their job. There are always more sides to a story.